Welcome to another edition of our iPad case roundup, where we scour the deepest recesses of the Internet to bring you the latest protective accessories for your beloved tablet! This week’s batch includes some cases that are definitely off the beaten path, some that were designed for the serious iPad owner, and some that are built for maximum protection. As always, there's a little for everyone—tuck in and enjoy! Autum: If you're the serious type who doesn’t think pulling out a fluorescent-pink case in the middle of a meeting is the right way to catch the attention of your business associates, you may want to invest in a Turncoat. This case's $144 price tag makes it clear that this stylish, black-leather offering is not for everyone, but the fact that it supports both the iPad and the iPad 2 (the latter with or without a Smart Cover) also indicates that the company is serious about making products that last. The Turncoat features a soft, suede interior and includes four hand-fastened straps. AviiQ: The Smart Case (iPad 2; $50) is designed specifically to complement Apple’s Smart Cover by providing additional protection—that looks and feels exactly like the Mothership’s own protector—for the iPad 2's backside. The case comes in the same black, grey, blue, green, orange, pink, or red as the Smart Cover, and it features anodized-aluminium construction combined with rugged plastic for maximum protection. BodyGuardz: The protective-film company’s Armor Carbon Fiber (iPad 2; $30) has been updated to fit the iPad 2. The Armor is noticeable for offering excellent scratch protection without adding significant bulk to the iPad. In addition, according to the company, the Armor Carbon Fiber includes one of the company’s screen protectors at no additional cost, thus providing end-to-end, scratch-free coverage of Apple’s tablet. The new model is available in black or white, matching the iPad 2’s colors. Innopocket: The EliteFolio Carbon Fiber Case (iPad 2; $199) is made entirely out of carbon fiber—except for its durable steel hinges, capable of rotating a full 360 degrees. The case's design allows it to act as a stand in a variety of different positions, including as a typing platform, while the tough outer material provides complete protection for your iPad. The EliteFolio is currently available for preorder, with expected delivery around the end of April. Killspencer: The misnamed iPad Case (iPad & iPad 2; compatible with Smart Cover; $150 and up) is actually a bag that provides plenty of extra pockets for personal items and fits both the original iPad and the iPad 2 (the latter with or without a Smart Cover). The bag is available in four different models: black twill, black leather, and canvas salvaged either from the Vietnam War or Operation Desert Sand. 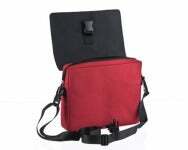 Its handy shoulder strap makes carrying your iPad a snap. Speaking of bags, the company’s Weekender 2.0 ($375) is a duffel bag that, in addition to being great for travel, features a waterproof internal zip pocket for your iPad. It comes black twill, olive drab, and the same two canvas styles. M-Edge: Where to begin? M-Edge has updated several of its protection accessories to be compatible with both the iPad 2 and its elder sibling. These include simple sleeves such as the Slip ($50; currently on sale for $15), and the Touring ($35); Each includes a handy pocket for additional storage space and features a generous amount of padding for maximum protection. The Touring is available in orange, blue, green, black, or red; the Slip can be had in black canvas with leather trimming. In the bag space, the company offers the Hip Bag ($50; currently on sale for $20), which features a shoulder strap and is available in black or a decidedly eye-catching magenta with lime green accents; and the Journey Bag ($40), which is available in blue and includes additional space for cables, power supplies, and the like. M-Edge also produces a number of sleeves and folios, such as the leather-clad Executive ($50; currently on sale for $40) and tough-fabric Latitude (price unavailable), each of which is available in several colors. The Platform ($40) adds its own twist to the genre by opening in portrait mode and featuring a convenient strap that helps you hold the iPad securely in one hand. The Capital (iPad 2; price unavailable) combines a three-point mounting system to hold the iPad firmly in place with a durable exterior and a large front pocket. A variant of this case also includes an integrated stand that provides a whopping fifteen viewing angles. NYC Subway Line: This company’s Neoprene iPad Case (iPad; $32) is a neoprene sleeve case that features a full-color print of the entire New York City subway system—undoubtedly handy for those who need to figure out how to navigate public transport in the Big Apple, and cool for those who wish navigating public transport in the Big Apple were one of their needs. The case also features a single-color print of the subway system inside, and the case's zipper closure sports a special token puller. SwitchEasy: The rather unique Cara (iPad 2; $50) looks like it would fit well in a James Cameron movie, or, perhaps, a documentary about the advanced technologies of a mysterious alien race. The case is built out of a tough elastometer material that, according to the company, offers superior flexibility and compared to regular silicone. SwitchEasy also includes a durable, scratch-resistant, polycarbonate screen shield, as well as two portable fold-out stands (one in black, the other in white—to match your particular iPad 2 model). The case's high-gloss finish is available in black, white, red, or red with a white back. The more traditional-looking Canvas (iPad 2; $50) is a folio-style case made of a hybrid polycarbonate/canvas design that mixes protection with style. It provides full-body protection, doubles as a viewing stand or typing platform, and even sports a magnetic closure to put your iPad 2 to sleep. It comes in black, brown, grey, and tan. Tuff-luv: The Multi-View Stasis (iPad 2; £35 and up) is a gorgeous folio-style case that comes in brown, red, or natural hemp, each with faux-leather trim. The case doubles as a viewing stand that provides multiple angles, and it includes all the appropriate magnets for putting your iPad to sleep when you close the front flap. The Tri-Axis (iPad 2; £29 and up) is a folio that can be used to prop up your device in landscape or portrait orientation, or to carry it around. The case supports multiple viewing angles in each orientation and comes in six different models that include several leather and synthetic-leather combinations.